The amount of money being made from the trafficking of drugs means that smugglers are not bothered about dumping the planes once used. Cocaine smugglers are torching planes after using them just once to get their product to the US, it has been revealed. The planes are either discarded or set on fire after landing on secret runways in Honduras having traveled from nearby Venezuela. Many are carrying drugs which have been grown and manufactured in Colombia and form part of a cocaine superhighway. And now CNN has found that the number of flights to Honduras, and therefore the amount of cocaine travelling to the US, is only increasing. It found that the number of suspected drug flights from Venezuela has risen from around two flights per week in 2017 to nearly one a day in 2018. Most are now departing from Zulia in Venezuela as is it closer to the American border saving traffickers on flying time. And traffickers are taking advantage of the current political turmoil and unrest to increase the number of flights leaving the country. The amount of money being made from the trafficking of drugs means that smugglers are not bothered about dumping the planes once used. With the news channel finding many of the planes to have come from the US originally. Around 240 metric tons of cocaine was estimated to have crossed into Venezuela from Colombia last year in order to be flown out of the country. An amount which the United Nations Office on Drugs and Crime estimated would fetch around $39 billion on the streets of the US, according to CNN. 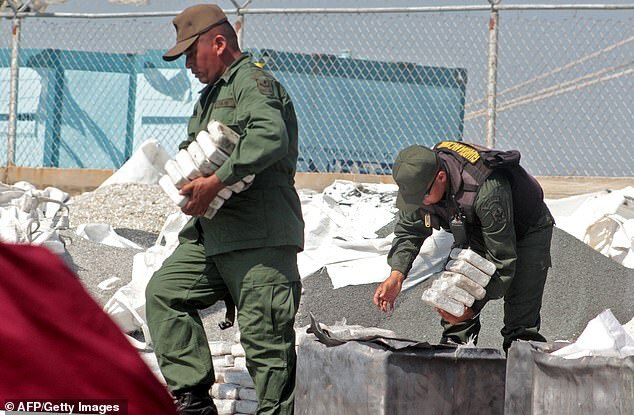 It comes after years of the US accusing high-ranking Venezuelan officials of drug trafficking, with Venezuelan president Nicolas Maduro's number two Diosdado Cabello in May 2018 sanctioned for reportedly being involved in narcotics trafficking activities. Something which he denies. President Donald Trump has been taking steps to isolate embattled Venezuela President Nicolas Maduro, who is holding power with help from other countries, including Cuba, China and Russia. It comes after a number of random power cuts in the country which crippled hospitals, and left neighborhoods without water. 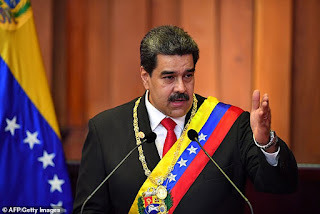 Maduro's government has blamed US-backed sabotage for the massive blackouts that have deprived millions of power, blaming 'electromagnetic, cyber and physical' attacks against the Guri hydroelectric power plant, which produces 80 per cent of the country's energy. The opposition blames a failure to maintain critical infrastructure and Juan Guaido on Saturday launched what he promised will be a 'definitive' escalation of pressure to force the country's embattled leftist leader from office.